After no small amount of wrangling and reformulation, I am finally ready to go live with the new Review Guidelines. To christen the new standards, I selected The Crowned Heads’ Las Calaveras. This is a limited edition annual release from Crowned Heads, produced by My Father S.A. Per the company description, it “is a respectful homage to those who have passed away in the year before, and is intended to be a celebration of their lives and remembrances, rather than a mourning or a symbol of sadness and death.” For 2014, a total of 72,000 cigars were produced (1,000 boxes of 24), evenly distributed among three vitolas – LC550 (5” x 50), LC652 (6” x 52), and LC754 (7” x 54). 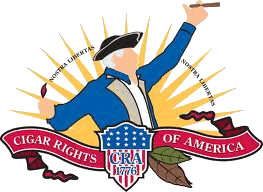 As is often the case with Crowned Heads’ products, symbolism runs deep. Even the arrangement within the boxes is meaningful, with 3 rows of 8 cigars. The “3 rows represent life’s cycle of a beginning, middle, and end. In biblical terms, the number ‘8’ signifies new beginnings, and in mathematical terms an ‘8’ laid on its side symbolizes “infinity,” as in eternal life.” The wrapper leaf utilized is an 8th priming Ecuadoran Habano Oscuro, enveloping Nicaraguan binder and filler. Today’s review covers the 6″x52 LC652, which retails for $9.55 in the Tampa market. Three cigars were smoked for this review, which were purchased by me at my local brick-and-mortar shop. Giving the Las Calaveras a preliminary once-over, it has a beautiful dark brown wrapper with consistently even coloration. The only deviation here is that today’s particular example has a bit lighter tint around the head, with a faint reddish hue. It is very oily to the touch, with smooth interstitial areas and light to moderate veining. As for prelight construction, the only noticeable variation is a slight soft spot in the pack density around the midsection of the cigar and a small wrinkle around the cap. Once clipped, it provides a faint aroma of cedar and hay from both wrapper and foot, with the foot aroma being just a bit sweeter in quality. The cold draw is deliberate but open and perhaps just tight of the “goldilocks zone” for me. Flavor on the cold draw is woodsy and sweet, with an oaken quality. Initial puffs on the lit Las Calaveras take off with a slightly sour bent, but this adjusts within a minute or so and it immediately jumps into a predominantly savory profile with just a touch of sweetness. The retrohale is crisp, but not overly sharp. Some of the pre-light woodsy character presents, still with an oaken quality. The retrohale is noteworthy here, and very pleasant. It provides a touch of spice but is manageable and never uncomfortable. Flavors throughout the balance of this first third are dominated by the oak, but supported by a sweet leathery flavor that comes across as a mild citrus. The burn wanders a bit in these early minutes, with some minor scalloping. Into the 2nd third, the burn has wandered a little more, although never wildly. The background sweetness has blossomed into a delicious citrus, although the savory leather has intensified concurrently to produce a fun interplay. The retrohale at this point produces a peppery tingle through the nose, which I personally find pleasant. These three aspects give the whole experience a great deal more “substance.” It creates a tangible, palpable experience. The Las Calaveras really shines during the early portions of its midsection. 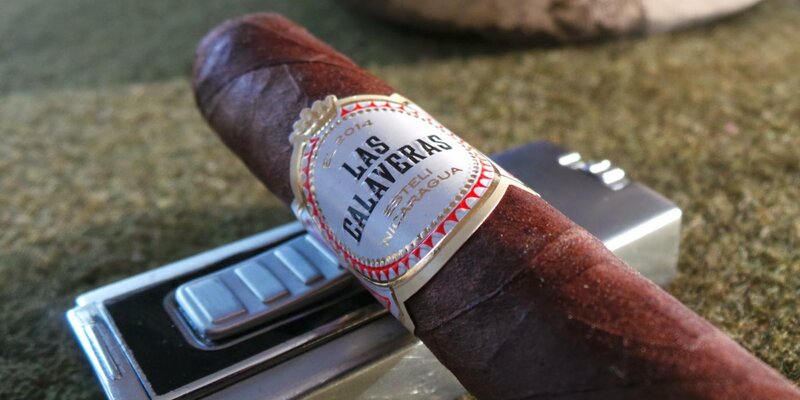 It’s worth mentioning however, that I have noticed a tendency throughout each of the Las Calaveras’ for the flavors to weaken if over-smoked. Too fast a cadence creates a slight acridity, so take it easy on the puffs….this is only noticeable because today’s example is a bit resistant to fire at this point. Nearing the end of the second third, it’s tough to walk this line between going out and over-puffing. The burn continues to waver somewhat, but I still have not had to touch it up. It has remained scalloped but self-policing. The final third of today’s stick was slightly problematic. The cigar had a tendency to go out, even with regular puffs. But let me be clear and fair because I don’t want to overstate the issue: this was not an experience-crushing concern; I just had to really pay close attention to my puffing cadence for 2 of the 3 Las Calaveras’ I smoked for this review. As mentioned above, the flavors can become weakened when the burn wanes, yet harsh if over-puffed. There’s a delicate balance that must be tracked closely to truly enjoy this cigar. When accomplished, one is rewarded with brilliant toasty, woodsy flavors over a sweet citrus core….when NOT, some harshness can creep in. Even still, none ever approached unpleasant or offputting. Aside from that, final portion was denoted by a noticeable uptick – in both strength and flavor. The flavor really shines in these final minutes if the burn is managed properly. The sweetness can develop into a roasted nut flavor that is very, very enjoyable. Nice review. New guidelines look like they’re working great, and the finale at the end is a cool touch. At the end, it has a stronger sweet mocha note and a little more savory spice note which is my favorite. Nice review! Thanks for sharing. Overall it’s an outstanding cigar.